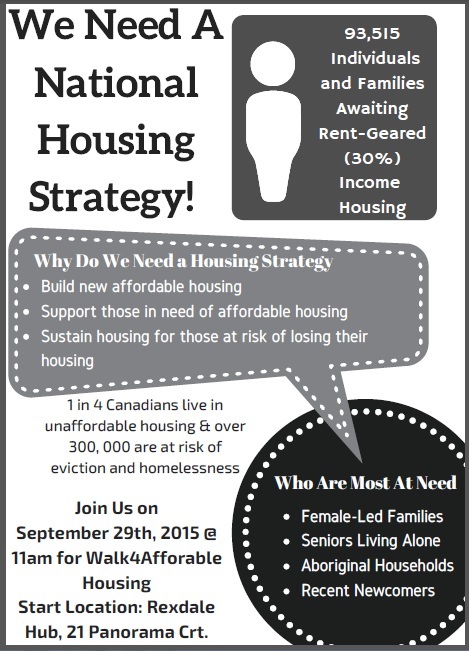 Please review the Picture of the information to see the details of Rexdale’s Walk 4 Affordable Housing, September 29, 2015. The walk begins at 21 Panorama and finishes at the offices of Kirsty Duncan, M. P. Make your voice count! This page links to Now Magazine’s article that lists some powerful conversations from the Toronto Public consultation. These conversations discuss the practice of carding by the Toronto Police Service. Rexdale’s own Andray Domise is among those quoted in the article. For more on this topic, don’t miss our clinic’s Carding Panel Discussion, September 30 at 6 pm, as part of our Annual General Meeting.